Octaform is a PVC, stay-in-place concrete forming system that is ideal for the construction of high performance structures. Octaform is a PVC, stay-in-place concrete forming system that is ideal for the construction of high-performance structures like vehicle washes, barns or commercial buildings. Because the built-in finish is watertight and food-safe, it is also ideal for tank construction. Whether it is for aquaculture, biogas* or even manure containment, Octaform is a superior yet economical choice. Octaform began as a designed in Canada, stay-in-place concrete wall forming system that reduces energy consumption and extends the life of high-performance concrete structures. Octaform’s product line now includes high-performance wall and ceiling panels. Octaform began its life in 1997 as a novel alternative to conventional wall construction. In an industry not always known for embracing new ideas, the company growth was steady but slow. The advantages were clear, however, to those that used the product. It went up fast, looked great and offered a level of concrete protection that few had even thought to ask for. Octaform’s team, led by Dave Richardson, continued to improve and tweak the concept, improving quality, versatility and performance. Bolstered by these innovations, improvements and a desire to help solve some of the problems facing the globe today, Octaform has been embraced by industries striving to affect positive change in the way we build, generate energy and even grow food. Simply put, Octaform is a stay-in-place, concrete forming system. Its closest comparison is to an insulated concrete form (ICF). Long considered by contractors to be an effective, green building material, ICFs provide excellent climate control and energy efficiency. Octaform provides all of these benefits and more. Because the forming system stays in place, the concrete wall is finished when formed – in one step. This eliminates the need for harsh coatings or cladding. Also, Octaform is extremely versatile. Unlike with traditional ICFs (that are similar in shape to Lego blocks), forming curved walls is a snap with Octaform. Add to this, a built-in, watertight, PVC lining and you have the world’s best solution for concrete tanks. The advantages of building tanks with Octaform are many and other sectors have already embraced our superior tank technology. It goes up quickly and its built-in, corrosion-resistant PVC finish ensures that your tank will outlast and outperform just about any alternative. 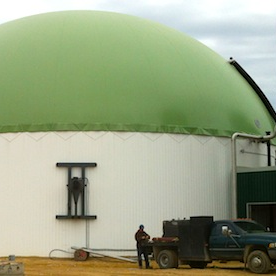 The conversion of agricultural waste to clean, renewable energy is a relatively new concept to North America but German biogas experts are already turning to Octaform tank technology for their systems. As European builders and farmers already know, anaerobic digestion is a highly corrosive process that will test the limits of any tank. Octaform’s built-in PVC finish offers the best possible defence against this while giving builders a fast, economic alternative to conventional formwork. The conversion of waste to energy can be done in many ways but what they all have in common is a highly corrosive digestion process that will test the limits of any tank technology. Builders around the world know that Octaform’s built-in PVC finish offers the best possible defence against this. Corrosion-resistance, however, is just one reason to build with us. With Octaform, you can actually build faster and better while saving money. In an AD system, cracks and leaks are not just a nuisance; they are escaping profits. Because Octaform’s built-in finish is watertight, you can stop worrying about corrosion, cracks and their subsequent repairs*. Downtime is a thing of the past. Concrete is already one of the toughest and most long-lasting building materials on the planet – Octaform makes it better. Whether enduring the hot Florida sun or standing strong against tsunamis and earthquakes, Octaform makes tanks that last. For more information, please visit Octaform website.